As I get older, I feel less enthusiastic about marking the anniversaries of horrible events (or even good ones). I hope that doesn’t sound callous, especially since I didn’t lose any friends or family members in the Twin Towers. But at some point, grief becomes self-perpetuating. I have known people who have built entire shrines to their grief as a way of holding on to it. I was familiar with this behavior on Sept. 11, 2001 from reading. I know it first-hand this year after losing my mother in a car wreck. Grief is something you have to let go of. And anniversaries are just one more way of preserving grief in amber. But for documentary purposes, I’ll tell you that as a New Yorker, I went through periods of shock, depression, mania and denial due to the terrorist attacks, if not nervous breakdown. I’ve heard there are studies suggesting that the closer you were to the towers on Sept. 11, the greater your chances of suffering post-traumatic stress disorder. I was two miles away, for whatever that’s worth. And looking back, I sometimes wonder if I indeed suffered from it, if not from some milder, derivative form of despair. I was a freelance journalist at the time, living in downtown Brooklyn. I had just finished up a morning Web feed for a financial news site when a friend called and told me to turn on the TV. Seems the World Trade Center had been hit by an airplane. I walked to the Brooklyn waterfront and found not one but both buildings gashed, with flames licking up the sides–vast walls of flames that it takes you a moment to realize are as tall as small buildings themselves. But why two crash sites? I thought at first that maybe one plane had sliced through Tower 1 and hit Tower 2 (though the trajectories didn’t match). The radio said two planes. “That’s impossible. Surely I’m hearing it wrong.” Terror wasn’t in my thoughts. Though I knew about Al Qaeda and the bombings of the U.S.S. Cole and the African embassies, I never really understood Osama bin Laden, a former U.S. ally whose beefs still seemed too esoteric and obscure to me. He didn’t seem to be a guy fighting against colonialism or for the freedom of his people but rather a self-important freebooter who felt double-crossed by the American military. He seemed so proud, blustering and overly sensitive that he had probably felt double crossed a lot in his life–by the Americans, by the Saudis, by his family. People like that make great sociopaths. I then made what in hindsight turned out to be a foolish decision. I decided to go back home and call a few editors to see if there was anything I could write about the emergency. I have never been much of a spot reporter, but 2001 was the year I had quit my job with the intention of being more of a go-getter. So I ran home thinking, again foolishly, that the fires, still burning at that point, would be contained. “Why sit here and watch it burn?” I thought. “It’s not like the towers are going to collapse.” In 1993, the World Trade Center had already been attacked, when a terrorist loaded up a van full of explosives. The destruction underground opened 100 foot holes five stories tall. And yet the towers stood. And a B-25 Mitchell had hit the Empire State Building in 1945 without felling it. My bad. As we all found out later, the math changes when the most vulnerable beams are all on the outside of your building. They didn’t have to melt. All they had to do was fail. I raced home to find out from the radio that Tower 2 had indeed fallen right where I’d stupidly left it. Shows how good a spot news reporter I am. I ran home from the real story. I then sallied back outdoors to see from my cramped Brooklyn vantage point what Lower Manhattan had turned into. Many TV cameras have caught the images of that day, so I doubt I could do them justice with poetic ruminations of destruction. But what had been lower Manhattan was subsumed in a dark purple-yellow cloud with some buildings sticking up out of it. It looked as if part of the sky had been erased by a furious illustrator unhappy with the work he’s done. But it was obvious from the columnar shape of the cloud that what had been erased was a building. A guy nearby on the Brooklyn waterfront said “I know there’s a God now because I’m over here and not over there.” It sounds horrible, but the graveyard humor started before both towers had gone down. I went back home to attend to e-mails flooding into my box from friends and family asking me if I was OK. On the map, I looked very close to the destruction, especially to people out of state. At some point I cried. I don’t remember what set it off. I think it was a friend’s letter asking me what they could do. I wasn’t sure what to do next, but then a friend from Texas gave me a virtual slap upside the head: “You’re a writer. Write about it.” As it happens, I had only one writing gig at that point at a nurse’s magazine. Not exactly what I had in mind. But they wanted a story. All of a sudden I was a real reporter covering a life and death situation. So I lay down on the floor and had a panic attack. Not only was I going to have to write about something I hadn’t come to grips with, but I was going to have to become a spot news reporter instantly, which I hadn’t been before. My chest hurt and I felt when I got up like I was going to fall over. At some point, though, I made it to the George Foreman grill, and shoved a piece of chicken into it, then ate the bland, vulcanized thing for the protein. It was the bit of strength I needed to get out the door. I went to St. Vincent’s hospital and found a press area, defying the press credential requirement and jumping into the pit. I asked doctors and nurses what kind of injuries they were seeing. Turns out, there weren’t many. Sept. 11 was extremely binary in its casualties list (at least during the first day) Either you died or you didn’t. You can read the story I wrote on it here if you like. It’s not Pulitzer material, but it got me through the day. Drinks were free that night. We told more inappropriate jokes. We asked each other if we were OK. Some people hooked up. Others just walked around. The next day was like a Saturday at Disneyland. People walked around with their kids in a light so soft it was almost impressionistic. People called friends they hadn’t called in years. Even I called an ex with whom I’d had an acrimonious break up. I don’t know why. I had to make sure she was OK. I met Stephanie a few months after the attack and went back to work full time and can say now that 2002 was one of the best years of my life, following 2001 which was undeniably the worst. I came through it better, but different. I am extremely clear headed about the political questions raised by 9/11. Whatever America has done in Chile, Nicaragua, Vietnam, East Timor, Angola or Cuba, you can’t possibly take the side of a murderous religious fundamentalist, somebody who wants to revive a medieval caliphate, and think it’s OK for him to murder American civilians to right American wrongs. If you are one of the people who think America had 9/11 coming, I don’t count you much of a thinker. I think of you as doctrinaire and sad. 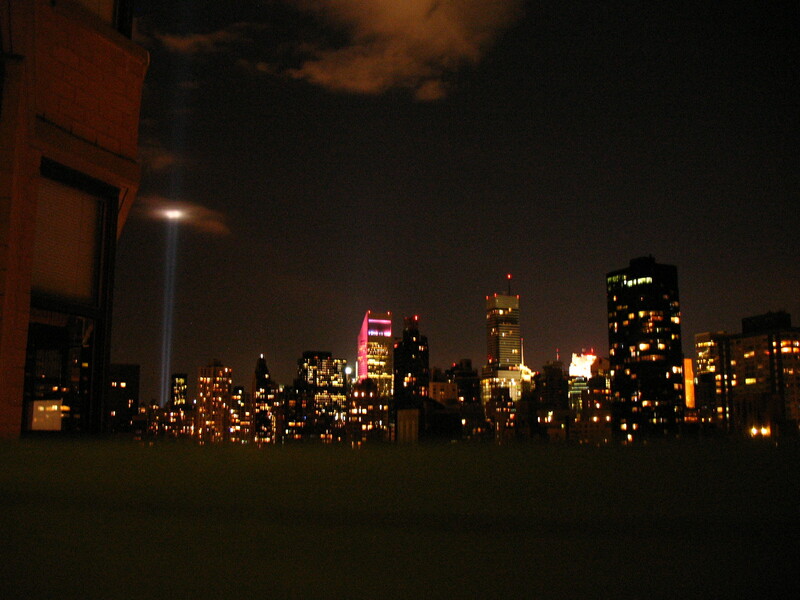 At the same time, the burden of introspection on Sept. 11 was unfortunately on those who were hurting the most. Only a few brave contrarians pointed out back then that Afghanistan was going to be a mess if we invaded. Now we have that mess. People cried war, because at the time we figured at least 10,000 people were dead and surely that was an act of war. Logic didn’t bear this out, however, since no government per se had attacked us. Ultimately I backed our president’s incursion into Afghanistan because the Taliban were at least undeniably protecting the people who attacked us. Not so, Saddam Hussein. Americans still in pain 20 months later were still not thinking critically at all, and they let George Bush and his cadre of think-tank neoconservatives take advantage of us by leading us to war in Iraq. We know in hindsight that we were vulnerable to manipulation. It’s very, very hard to say we should have anticipated it from Day 1. But the political realities are just one thing that have made me grow up. More important was that 9/11 made me realize how much I love my city. Moving here and becoming part of New York with its bustles and frustrations had been a dream of mine since I was little. Learning the city means making it a part of your body–you have to know the rhythms, the steps, the hustles, the battles. You have to know when to step back from the subway. You have to know when to fight city hall and when not to. When you make the city so much a part of your own body, perhaps it just makes sense that you would hurt when it hurts. The strangest thing I can say about 9/11 is that, even though I didn’t lose anybody close to me in those planes or in those buildings, I took the attack very personally. This great metropolis they had built was in my mind, despite its flaws, a paradise. And to see so many ideals ripped down at once–the aspirations of young people, the aspirations of peace makers, and the aspirations of people who build things like tall buildings–was the saddest thing to me as a New Yorker and a young person, too. Soon, I wasn’t young anymore.